New York Rangers President and General Manager Glen Sather announced today that the club has named Mike Sullivan assistant coach. Mike Sullivan, a Rangers draft pick in 1987, re-established his ties to both the team and John Tortorella on Thursday. Sullivan, 41, begins his first season as an assistant coach with the Rangers after spending the last two seasons as an assistant coach with the Tampa Bay Lightning. 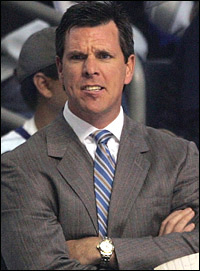 He served as an assistant coach under John Tortorella with Tampa Bay during the 2007-08 season. Prior to joining the Lightning, Sullivan served as head coach for the U.S. Men's team at the 2007 World Championships in Russia. He also served as assistant coach for the U.S. Men's Olympic Team at the 2006 Olympic Games in Torino, Italy. Sullivan began his coaching career in 2002 as head coach of the Providence Bruins in the American Hockey League (AHL). He led Providence to a 41-17-9-4 record and first place in the AHL's North Division through the team's first 71 games, before being named assistant coach of their parent NHL club, the Boston Bruins. The following season, Sullivan was named head coach of the Bruins (NHL), and led the team to a 41-19-15-7 mark and the Northeast Division title. In two seasons as Boston's head coach, he posted a 70-56-15-23 record in 164 regular season games. Prior to joining the coaching ranks, Sullivan skated in 709 career NHL games in 11 seasons with the San Jose Sharks, Calgary Flames, Boston Bruins, and Phoenix Coyotes, registering 54 goals and 82 assists for 136 points, along with 203 penalty minutes. The Marshfield, Massachusetts native was originally selected by the Rangers in the fourth round, 69th overall, in the 1987 NHL Entry Draft. He began his NHL career with San Jose in 1991 after spending one season with the San Diego Gulls of the International Hockey League. Prior to turning pro, Sullivan attended Boston University, where he skated in 141 career college games and registered 61 goals and 138 points over four seasons.